A novelty at Munich 2016. 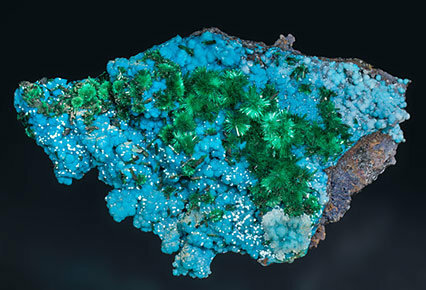 Until now a poorly known mine, the Brochantite forms sprays of finely acicular crystals with a very intense silky luster and a very vivid color and are on a Quartz (variety chalcedony) matrix. Aggregate of elongated idiomorphic crystals with very well defined faces and edges and sharp chisel-like terminations. Their definition, crystal size, as well as their color and luster and, in general, very high quality, make them the world's best for this species. 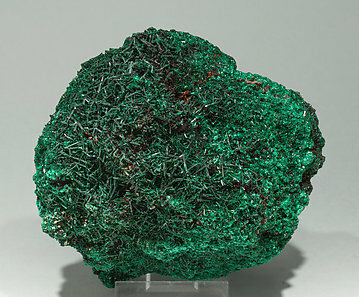 Aggregates of very elongated idiomorphic crystals with very well defined faces and edges coated by a later generation with a satin luster and lighter green fibrous Brochantite growths. 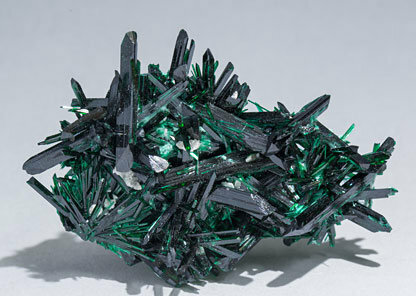 The main crystal has a perfect termination, as shown in the close-up photo. In our opinion, the world's best for the species for their definition, crystal size, as well as their color and luster and, in general, very high quality. 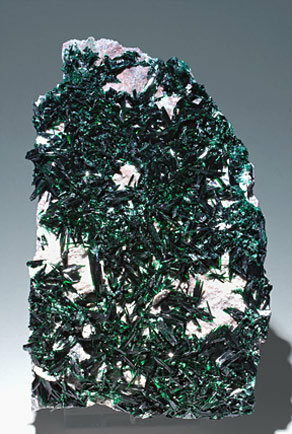 Aggregate, on matrix, of elongated crystals, some of them doubly terminated, with very well defined faces and edges and sharp chisel-like terminations. 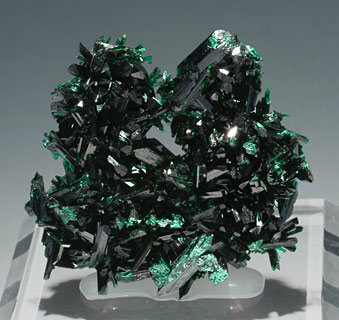 The crystals are very bright and have a very deep color. Due these characteristics, in our opinion, they can be considered as the best for the species. Irregular aggregates, on limonite matrix, of acicular crystals with an intense color and an excellent luster. 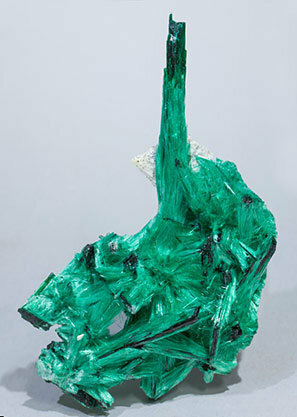 Aggregates of acicular crystals with a green color clearer than usual, on limonite matrix. We specially note the locality, not well known for the species. A novelty at Tucson 2015. Fibrous Brochantite is very well known at the Milpillas mine but this sample has aggregates of elongated idiomorphic crystals with very well defined faces and edges and chisel like well-terminations. 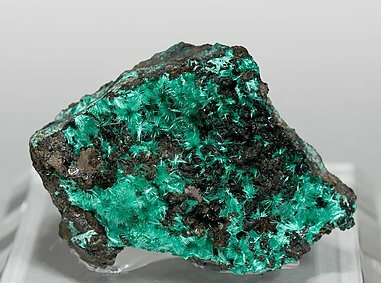 In our opinion, the world's best for the species for their definition, crystal size, as well as their color and luster and, in general, very high quality. A novelty at Tucson 2015. Fibrous Brochantite is very well known at the Milpillas mine but this sample has aggregates of elongated idiomorphic crystals, one of them clearly isolated and doubly terminated, with very well defined faces and edges and chisel like terminations. In our opinion, the world's best for the species for their definition, crystal size, as well as their color and luster and, in general, very high quality. A novelty at Tucson 2015. 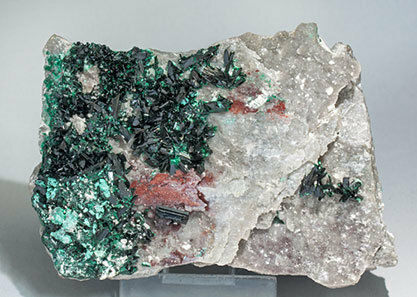 Fibrous Brochantite is very well known at Milpillas mine but this sample has an aggregate, on matrix, of short and thick idiomorphic crystals with very well defined faces and edges and chisel like well-terminations. In our opinion, the world's best for the species for their definition, crystal size, as well as their color and luster and, in general, very high quality. A novelty at Tucson 2014. 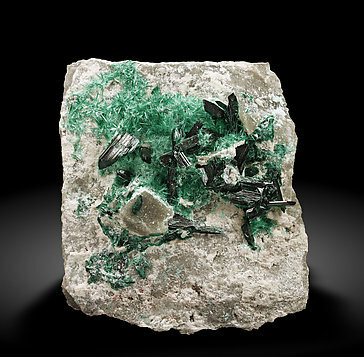 Although the Brochantites from the Milpillas Mine are well-known, this time they appear in solid, chisel like well-terminated crystals, which makes them, in our opinion, the world's best for the species for their luster, sharpness and, in general, very high quality. 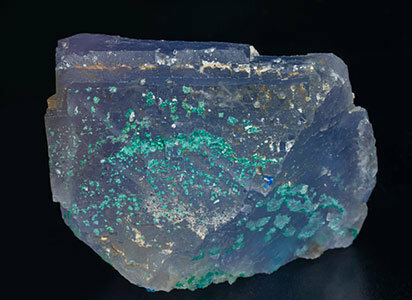 Radial growths of green acicular Brochantite microcrystals on a crystalline Fluorite matrix that is translucent and has a sky blue color with slightly violet zones. Very unusual, the sample is from an old collection. A novelty at Munich 2016. Spray-like aggregates of finely acicular crystals with a very intense silky luster. 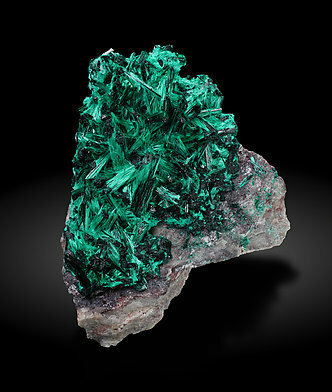 The Brochantite is with small Atacamite crystals that have a darker green color. They are on a rocky matrix with Quartz (variety chalcedony) coatings. 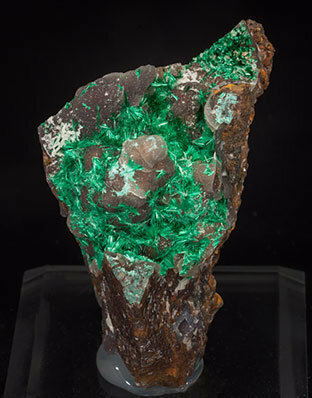 The sample is from a formerly poorly known mine. A novelty at Munich 2016. 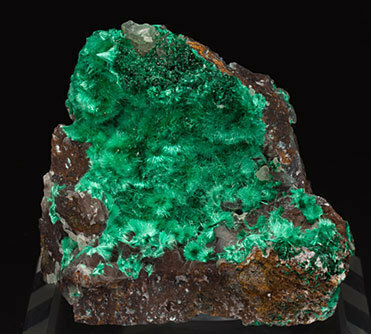 Until now a poorly known mine, the Brochantite forms sprays of finely acicular crystals with a very intense silky luster and a very vivid color. 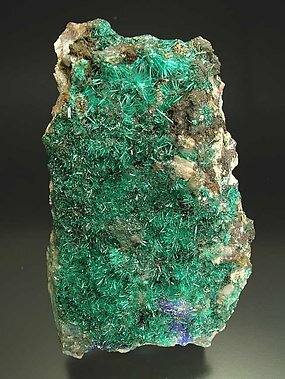 They are with darker small Atacamite crystals and are on a Quartz (variety chalcedony) matrix coated by botryoidal Chrysocolla growths. 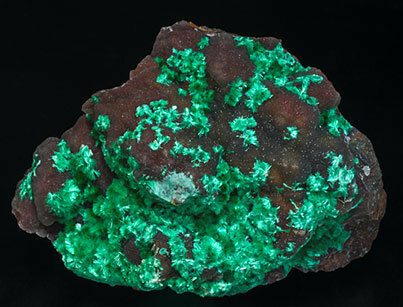 Very aesthetic for the contrast of the Brochantite with the Chrysocolla. 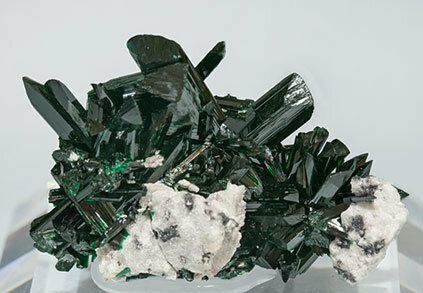 Predominating Brochantite fills the specimen of green color and embellishes the upper part with beautiful radially divergent groups of acicular crystals. A novelty at Munich 2016. 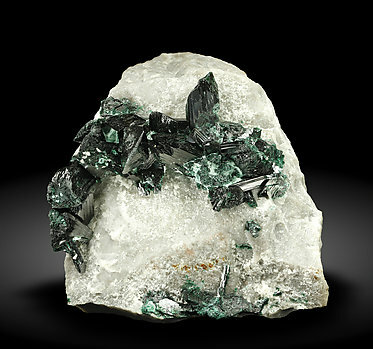 Spray-like aggregates of finely acicular crystals with a very intense silky luster. They are on a rocky matrix with Quartz (chalcedony variety) coatings. 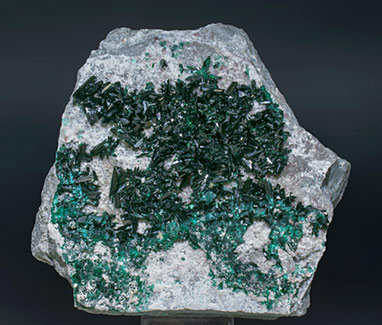 The sample is from a formerly poorly known mine. 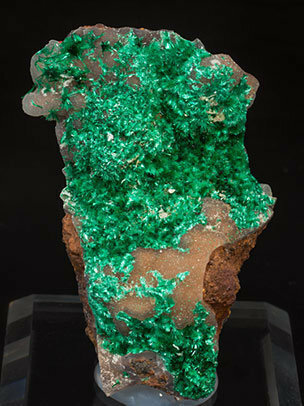 Radial sprays of delicate acicular crystals of Brochantite with a very intense silky luster in a dense coating with small darker green Atacamite crystals on a rocky matrix with Quartz (variety chalcedony). 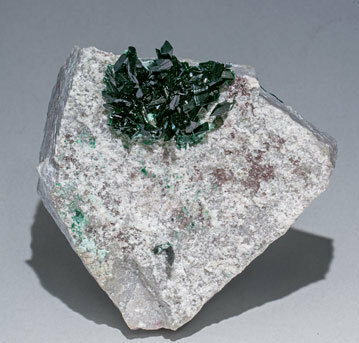 The sample is from a formerly poorly known mine.